Natural Gas Combined Cycle (NGCC) plants burn fossil fuels more cleanly than more traditional technologies. For instance, NGCC was introduced in the UK during the 1980s and formed the basis for the technological transformation in the UK power industry during the 1990s. An important stimulus in this process was the privatisation of the UK’s electricity and gas industries which changed the rules governing new investments and triggered a wholesale switch to cheaper, cleaner NGCCs, whilst the ‘dash for gas’ represented a particularly powerful manifestation of a global trend towards the use of NGCCs (Watson, 2001). Most NGCCs work in the following ways (conventional coal-fired steam turbine plants (IEA, 2008). NGCC plants emit less than half the CO2 emissions of similarly rated coal-fired plants. A key challenge in meeting the gas demand related to conversion to natural gas-based technologies (e.g. from coal-based plants) is gas transportation (Jepma and Nakicenovic, 2006). As with oil, there are long distances between the world’s richest gas resources and places where most gas is consumed. Western Europe, North America, South Asia and China – the areas where gas demand is projected to grow most rapidly – have relatively small supplies, while over two-thirds of the world’s proven gas reserves are located in the Russian Federation and the Middle East. Southeast Asia has significant offshore deposits, but delivering this gas to the market requires the construction of an extensive pipeline network. Delivering gas from concentrated supply sources to distant demand centers will require a major expansion of natural gas transportation infrastructures – pipelines to move compressed gas as well as ships to transfer liquefied natural gas (LNG). Other possibilities for natural gas transport or storage are compressed natural gas (CNG), gas-to-liquids (GTL), and stranded gas. An important barrier to the application of higher efficiency natural gas combustion technology is that the price of natural gas per british termal unit (btu) is generatlly higher than the price of coal per btu. The natural gas price also tends to be more volatile than coal prices as it's development is often connected to oil price development. In developing countries, switching from coal to natural gas in energy production could largely contribute to solving local air pollution in large cities. For instance, since coal is the most widely used fuel in China, the country faces serious coal-smoke pollution in urban areas, with PM-10 and SO2 as the main pollutants (ENTTRANS, 2008). Natural gas, although not the dominant energy source in China, is now becoming one of the most attractive cleaner substitutes for coal. However, technical barriers for switching from coal to natural gas, relatively high natural gas price, high cost to change boilers, high additional expenditures on initial installation fee or gas source fee have thus far prevented a fast penetration of natural gas-based technologies in China. These barriers could be reduced by a market oriented system reform in natural gas production and retailing systems, availability of foreign and private capital for formerly strictly state-controlled natural gas production, and a transportation and municipal distribution infrastructure regime to solve the capital shortage problem in most Chinese cities. Finally, an incentive for natural gas could be provided by including negative externalities from coal burning in the price of coal-based energy production. Efficiency of gas fired plants has increased between 1992 and 2005 from 35% to 42%. This improvement can be largely attributed to the introduction of large combined-cycle units, which now account for 38% of global gas-fired capacity (IEA, 2008), although the range of efficiencies among regions might differ strongly. For instance, in 1992, the US Department of Energy’s Fossil Energy programme began an intensive effort to increase gas turbine efficiencies (Xiaotao et al., 2005). Within eight years, this programme produced turbine systems that could operate at temperatures in excess of 1,426°C (300 degrees hotter than conventional turbines) and could achieve efficiencies of over 60%. 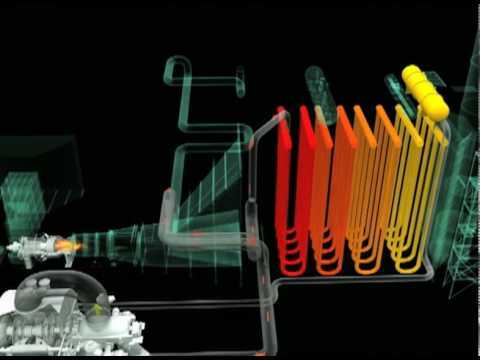 At the same time, new combustion techniques were developed to limit the NOx emissions (the principal air pollutant released by gas turbines). As a result, future high-efficiency natural gas turbines will continue to be one of the cleanest ways to generate electricity from fossil fuels. Nonetheless, despite their relatively high efficiency, NGCC plants' efficiencies could fall when plants are run at varying loads (IEA, 2008). Important aspects of further developing NGCC technology are the design of the turbines and ways to improve efficiency. This can be achieved by higher firing temperatures and the use of residual heat, as well as increasing aerodynamic efficiencies of components, reducing the number of compressorand turbine stages, and improving the mechanisms for turbine stator and blade cooling (IEA, 2008). To produce electricity, natural gas is burned in a turbine similar to a jet engine, and the turbine runs a generator. The conventional method, which is widely used in commercial power generation, burns natural gas with a flame. Researchers are trying to eliminate the flame, replacing it with a catalyst that combusts methane at lower temperature, emitting less smog-producing NOx pollution. The catalytic combustion technology is promising as a future energy source because it generates less pollution without losing efficiency (http://www.caprep.com/0305038.htm). Presently, the world gas turbine market has four large manufacturers: Alstom Power, General Electric, Siemens-Westinghouse, and Mitsubishi Heavy Industries. Larger gas turbines with higher power outputs are mainly used in combined cycle plants for heat and power cogeneration. Their application in combined cycle power plants will deliver a larger output increase than smaller gas turbines, since the electrical efficiency of the combined cycle is higher than that of a simple cycle (approximately 15-20%-points depending on the output of the plant). Therefore, large gas turbines with their higher electrical efficiencies in both simple and combined cycle systems will provide better energy conservation and utilisation (ENTTRANS, 2008). Switching from coal to gas is considered to significantly reduce greenhouse gas emissions (Kloeppel, 2002), since the carbon content of natural gas per unit of primary energy content is only 60% of that of coal. The CO2 reduction effect could be enhanced by the higher efficiency of state-of-the-art natural gas turbines in comparison to older coal-fired power plants. The latter effect would contribute an additional 30% emission reduction. In addition to CO2, coal and natural gas use also results in methane emissions. In the case of coal, methane trapped in and around coal seems is released during mining activities. With natural gas production, methane is released whenever gas escapes during transportation and distribution. Hence, switching from coal to gas would reduce methane emissions from coal mining, but increase natural gas-related emissions. In addition to GHG, the combustion of coal can release tremendous quantities of SO2. In the atmosphere, SO2 is quickly oxidised to sulfuric acid, which condenses onto cloud droplets and aerosol particle surfaces to form sulfate aerosols, which tend to cool the Earth’s surface. In contrast, black carbon, released in the form of soot from coal-fired power plants, forms the nuclei of infrared-absorbing carbonaceous aerosols that have a short-lived warming effect on the atmosphere. Thus, natural gas-for-coal substitution would reduce the cooling effect of sulfate aerosols while simultaneously reducing the warming effect of black carbon. The long atmospheric lifetime of CO2 in comparison with aerosols means that coal-to-gas switching will always result in a net long-term climate mitigation benefit. Other factors that affect the outcome of the switch include the sulfur content of the coal, the natural gas leakage rate, and the difference in efficiency between the coal and gas power plants. Careful selection of the coal plants to be replaced and of the gas technology could enhance the extent to which fuel switching reduces the net climate impacts of fossil fuel burning. SO2 and other emissions from coal use are responsible for a number of environmental issues related to human health and air quality. In the USA, coal-fired power plants generate two-thirds of the country’s SO2 emissions. Controls on these and other harmful substances are expected to become even more stringent in the near future as more and more nations recognize their immediate impact on the local environment and health. In developing countries most evidence suggests that people in cities with high levels of air pollution increasingly suffer from air pollution (Energy Information Administration, 1998). In China, where in 2000 natural gas accounted for only 2% of total energy use (Lyman, 2000), but which could triply by the year 2010 due to the above-mentioned developments in gas investments (including LNG). Again, the concept of a Eurasian energy infrastructure is emerging, and major pipeline imports are under consideration from Siberia and Sakhalin Island. Within China gas distribution grids are being built. Making natural gas a universal energy source in China could strongly contribute to solving several environmental and health problems in Chinese cities and towns. In addition, natural gas is critical for China’s energy future, as by 2020 China could meet up to one-third of its power generation needs with natural gas by manufacturing gas turbines domestically and developing low-cost natural gas sources. This would be more cost-effective than coal use. If China combines new exploration technology with market and regulatory reforms, then it could rapidly increase the amount of gas available for residential, industrial, and power applications. The environmental pollution scenario for India is also alarming. A recent survey by the Central Pollution Control Board India has identified 23 Indian cities to be critically polluted. Twelve major metropolitan cities in India produce 352 tonnes of N2O, 1,916 tonnes of CO due to vehicular emission and 672 tonnes of hydrocarbon. The SO2 and NOX in the ambient air of India are above the WHO safety limit, which could have a serious impact on the health of the community. In 2000, natural gas accounted for less than 4% of India’s energy need (Lyman, 2000) and this is projected to grow rapidly as infrastructure is being built and gas flaring is being reduced in the country. Nevertheless, India will ultimately import most of its gas requirements either by pipeline or as LNG. In this regard, gas lines from Iran and Bangladesh are being considered and LNG from Oman and Abu Dhabi will be used for electric power at Dabhol. As explained above, switching from coal to NGCC could strongly reduce GHG emissions (Kloeppel, 2002), since the carbon content of natural gas per unit of primary energy content is only 60% of that of coal. Using NGCC plants instead of coal-fired plants would also contribute to reducing methane emissions. Nonetheless, natural gas-based power plants and surrounding systems contribute to GHG emissions themselves; together with oil system natural gas systems account for between 15 and 20% of global methane emissions (IEA, 2008). Methane emissions in these systems are largely caused by equipment or pipeline leaks and venting activities. For calculation of these GHG emission reductions, it is recommended to apply the approved methodology for Methodology for conversion from single cycle to combined cycle power generation (ACM0007) which has been developed under the Clean Development Mechanism of the UNFCCC Kyoto Protocol (CDM) for projects improving a gas-fired system from a single to a combined cycle plant. This methodology helps to determine a baseline for GHG emissions in the absence of the project (i.e. business-as-usual circumstances), how emission reductions below this baseline can be calculated, and how these reductions can be monitored. For NGCC plants which replace coal-fired or oil-fired plants, the methodology Consolidated baseline and monitoring methodology for new grid connected fossil fuel fired power plants using a less GHG intensive technology --- Version 3 can be applied. For certain applications CNG costs were estimated well below the LNG costs. For example, for a transport distance of 1710 km the LNG transport cost was about USD 2.5 per million btu while the CNG cost was about USD 1.5 per million btu (see Figure 33‑2) (Gudmundsson et al., 2002). The curve depicted as ‘Pipe’ in Figure 33‑2 shows the investment capital needed for frfora typical natural gas transportation pipeline. These costs are assumed to amount to USD 1 million per km transport distance. The capacity of such a pipeline will likely be greater than the 4.1 bcm per year. The ‘Pipe’ curve illustrates that for distances longer than 1000 km, transportation of gas via pipelines is cheapest. After that CNG (NGH in the Figure) is the cheapest option. LNG becomes cheaper than pipeline transportation after 1800 km. The fourth line in Figure 33‑2, identified as ‘Syncrude,’ represents the capital cost of natural gas transport based on synthetic petroleum. The background data and details used to arrive at the ‘Syncrude’ line, were presented by Gudmundsson et al. (2002). The cross-over distance from LNG to syncrude is about 6000 km. Therefore, transportation of natural gas via syncrude is cheaper than via LNG for long distances (Singleton, 1998). (1) Coal Steam Turbine vs. Natural Gas Turbine Technologies (Loose). Evidence available in the literature indicates gas turbine technologies produce energy at lower unit cost than coal steam turbines. According to Energy Information Administration (1998), there could even be a cost advantage of 25%. While the coal plant has a significant fuel cost advantage over the gas turbine, the per unit capital costs of the gas turbine facility are considerably lower than those of the coal plant. Projections for plants coming on line in 2020 show similar differentials but the gas turbine cost increases a little, eroding the cost differential between the two technologies to 19.2% (Energy Information Administration, 1998). Nowadays, with higher natural gas prices and new technology developments in the coal-based technology, in particular IGCC has become a competitive option when compared to conventional combined cycle or coal steam turbine cycles. For a gas-fired power plant, the total investment includes the cost of specialised equipment, plant site infrastructure, mechanical infrastructure, buildings, the specialised equipment, etc. The specialised equipment includes the gas turbine, the steam turbine, the heat recovery boiler, the water-cooled condenser, the fuel gas compressor, the continuous emissions monitoring system, the distributed control system, and the transmission and generating voltage equipment packages. The total investment costs and cumulative cash flow during the system lifetime (20 years) both increase with increasing GTCC output as shown in Figure 33‑3, but the growth rate of investment costs is much lower than that of the cash flow. Therefore, the larger the output of a GTCC power plant becomes during its lifetime, the more profitable it becomes. The possibilities of technological leap-frogging could enable developing countries increasing energy supply with a limited increase in GHG emissions. Foreign direct investment might play an important role in bringing advanced technologies to developing countries. From 1978 to 1993, international sources invested approximately USD 14.3 billion in the Chinese power sector, approximately 10% of the country’s total investment during that period. These funds were used in 63 large- and medium-scale projects with a combined capacity of 40 GW, mostly hydro energy. 85% of the foreign funds were provided by public sector sources – foreign governments and multilateral lending institutions like the World Bank and Asian Development Bank. Foreign direct investment played a very minor role. Studies by IEA (2002) and Dong and Logan (2002) have pointed out that the Chinese natural gas development follows the traditional government-managed and supply-pulled model. The central government will invest through state-owned gas enterprises and finance through state banks and security markets. Energy Information Administration, 1998, Annual Energy Outlook, 1998, with projections to 2020, DOE/EIA 0380(98). ENTTRANS, 2008, Sustainable, Low-Carbon Technologies for Potential Use under the CDM – A description of their environmental, economic, and energy aspects, Groningen, the Netherlands. Gudmundsson, J.S., M. Mork and O.F. Graff, 2002, Hydrate Non-Pipeline Technology, 4th International Conference on Gas Hydrates , 19-23 May 2002, Yokohama. Kloeppel, J.E., 2002, Substituting natural gas for coal offers long-term climate benefits <http://www.is4ie.org/resources/Documents/ISIE_2009.pdf> (Last accessed on 14 June 2010). Lyman, J., 2000, ‘US-Japan Energy Cooperation: to Help Achieve Sustainable Development in Asia’, Energy Outlook for Asia. Xiaotao, Z., S. Hideaki, N. Weidou and L. Zheng, 2005, ‘Economics and Performance Forecast of Gas Turbine Combined Cycle’, Tsinghua Science and Technology, Vol. 10, No. 5, October, pp. 633-6.